It really does annoy me with all of the negative press that is banded around in the media, rather than trying to focus on the real political issues in hand. This happens more and more these days and you realise why the general public just don’t have a clue what is going on in politics. Gone are the days of getting down to setting out the real policies and changes that will be made to the country, to more column inches in the papers given to what MP’s get up to in their spare time. I haven’t read all of the full accounts of what is being said about Gordon Brown behind the scenes of No. 10, but part of me really doesn’t care … then part of me does care. It has been reported / alleged that Gordon Brown will often lose his temper, maybe throw things and on occasion grab or shove the nearest person to him. He sounds like a bit of a hard nut! But in a sense isn’t this the sort of person that we want as a leader, rather than a dithering idiot or yes man? Let me set one thing straight … I don’t really have an allegiance to any particular political party as I think that they are all pretty much the same these days, but what I do know is that I am sure that being the Prime Minister is one of the toughest jobs going. 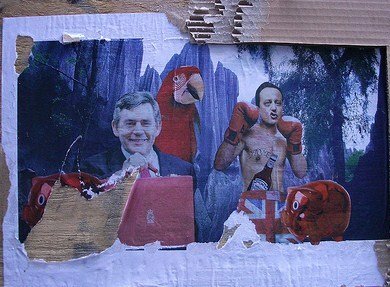 I’m not surprised that Gordon Brown loses his temper when you look at some of the numpties that he has working for him! Talk about a stressful job! We had an interesting discussion at work the other week about the leadership and the cabinet ministers and what real qualifications have they have got to lead major government departments or lead the country. Also how come one minute you can be the Home Office Minister looking after the country’s security and the next you are the Minster of Education. It just doesn’t make sense really as in the real world you tend to have to have qualifications of sorts and some experience in the field. I wonder what the next few months will hold as we head nearer to the general election. Will it all be about who has the best strapline or logo … or will we actually get to see a televised debate with the leaders of the parties discussing the real issues that their parties will be sorting out, without skirting around the questions? I wish there was a website or comparison site that actually outlined clearly what the real differences in the policies will be (maybe there is), so that I can work out which party ourselves personally and the company will be better off with. It would be good if we could have a strong leader in a similar guise to Churchill or Thatcher. Sure Thatcher wasn’t universally loved but as the woman in power she certainly had more balls than her successor. Unfortunately the Prime Minsiter has to be the kind of person that works towards simply offending no one in case of losing votes or support. I’d respect more a leader who came out and said we’ve fucked it all up, were trying to fix it but we need an extra bit of tax for a few years, rather than hiding tax increases in places we’re less likely to notice.